A positively impressive townhome is all about Style and Location, Location, Location! This recently updated Dallas townhome has all the features on your list including hardwood floors, granite counters, and attached full sized 2 car rear entry garage. Entry level features a spacious bedroom, full bath and built-in Study area for convenience. The large Living area has a wall of windows, beautiful wood floors and is wired for sound with 2 installed Pioneer Elite 12? ceiling speakers plus wiring for more speakers. The kitchen is on 2nd Floor with Living and Dining rooms and has granite countertops, travertine floor, tons of custom cabinets, center island with power, stainless steel appliances, (including convection oven and side by side refrigerator that stays with the property) and great corner pantry. Don?t miss the smart storage under the stairs on this level. Generous sized Master Suite is on 3rd Level with vaulted ceiling, walk-in closet, large bathroom with separate vanities and separate shower and soaker tub. Guest Suite is also on the 3rd Floor with walk-in closet and in-suite private bath. 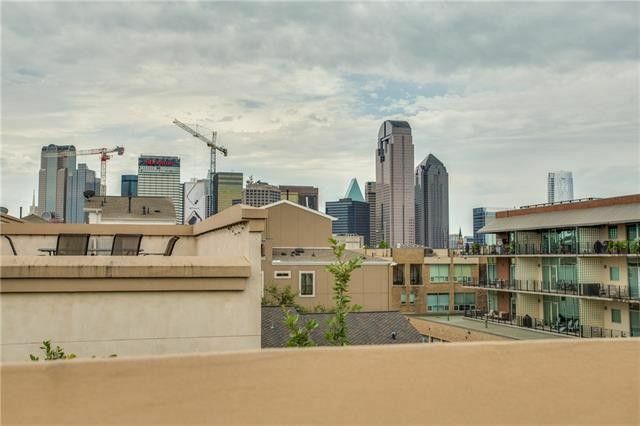 A frosted glass door leads to the cute balcony with a spiral staircase winding up to the large epoxy sealed Rooftop Deck, perfect for star gazing and viewing fireworks over Downtown Dallas. This townhouse community is in a fantastic location just West of Exall Park where you can enjoy baseball, basketball and more. The 465 quarterly HOA fees include exterior landscape, water and waste services, so fewer utility bills to pay. Other features include 3 zoned HVAC systems - 1 for each floor - allowing tailored temperature control, updated paint, carpet, and fixtures throughout and ample free street parking within a block of the property for friends to use when they come to visit your new place! This home's location has so much to enjoy! Within a mile, you can take your pups to Meadow Foundation Dog Park or head over to Exall Park or Klyde Warren Park. Then check out Deep Ellum or enjoy all that Dallas's Art scene has to offer at Dallas Museum of Art, Nasher Sculpture Center, Dallas Symphony Orchestra, Winspear Opera House, Dallas Theater Center and many more shops, nightlife and eateries! You won't run out of fun things to do at home or around town! Directions: Easy access from 75. Just up the street from Exall Park. There are 4 unassigned parking spaces at the end of each row of buildings (by Live Oak). Park in these spaces or on Skiles or Bryan. Do not park on Birkenhead! Exclusions: Refrigerator in property remains with property.Don't miss great storage under the stairs on 2nd Level.